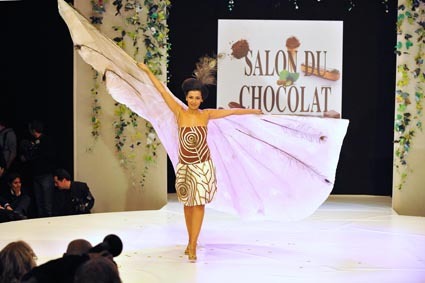 The world famous Salon du Chocolat took place in Paris last weekend, the latest stop in the festival's year long jaunt around the globe. Chocolatiers, chocolate producers, and chocolate fans descended upon the city for five days of exhibitions, demonstrations, and oh, yeah, chocolate . . . as far as the eye can see. 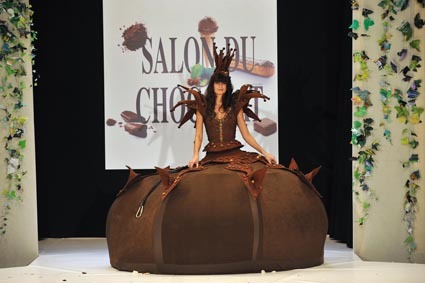 Oh, course, my favorite part of Salon du Chocolat, whether it's in Paris, Madrid, or Tokyo, is the chocolate fashion show! 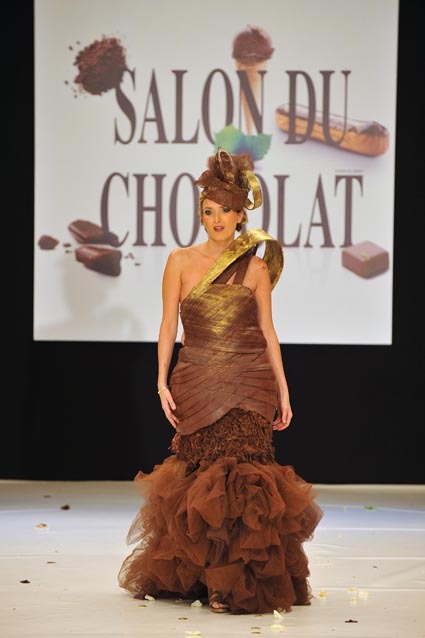 That's when you get to see models strut their stuff wearing oodles and oodles of chocolate jewelry, hats, and clothing. Seriously, it’s fashion and chocolate. What’s not to love?? 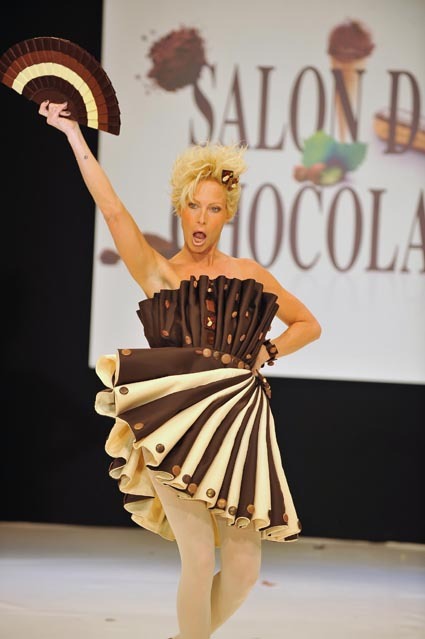 My favorite outfit by far was the dress by chocolatier Patrice Chapon (see below). Totally breathtaking! 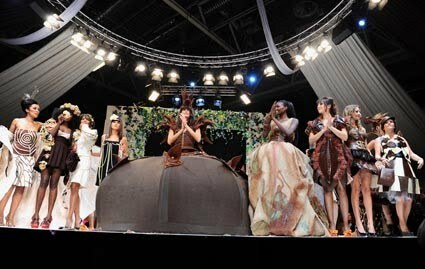 The Salon du Chocolat fashion shows, are held in major cities throughout the year. The U.S. version takes place in New York November 11-14. You can find more info right here. If your interested in seeing pastry chefs creating fashion out of chocolate, check out the Edible Fashion episode of Bravo's Top Chef: Just Desserts. 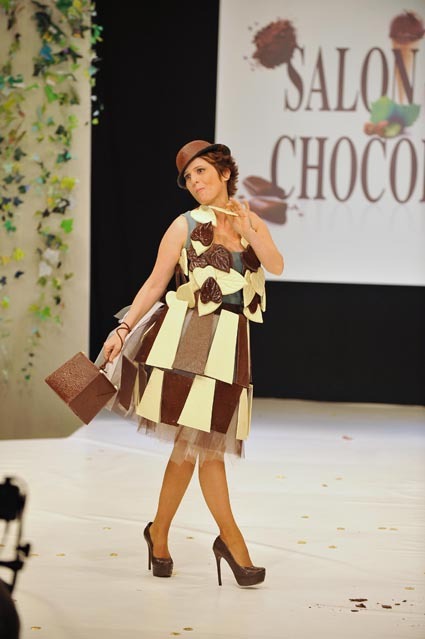 A recent challenge featured the chefs creating chocolate outfits and I was super impressed with the results! For more info, click here. This is amazing - how did I not know this existed! I work with chocolate every day, but I wouldn't even know where to begin to create anything like these. I saw the Top Chef Just Desserts episode you were referring to and it was amazing as well. Thanks for the post! Wow - these outfits are incredible! Wow, I'd never heard of this before. How on earth do they keep the chocolate clothes from melting? How do they make chocolate tuille? I'm seriously gobsmacked! Oh my goodness! This is incredible!! if i were in that fashion show, the floor will be filled with my saliva.XD i'll keep on drooling. lots of chocolates. this is just so amazing! Shaz: I *think* the tulle is actually fabric and just the top part of the dress is chocolate, but I'm not sure. Sometimes it's kind of hard to tell! Maybe it's tulle covered with cocoa powder?